How Do We Package Our Shipments? 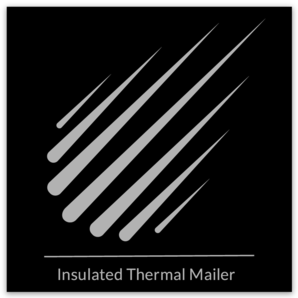 The answer is with extreme care and in insulated thermal mailers. Packaging is normally an afterthought when purchasing over-the-counter products. Most vendors selling in online marketplaces are focused solely on maximizing profits and use the cheapest possible packaging. This is understandable given the marketplaces themselves are taking up to 20% of the profits. For these small vendors to survive, they must be extremely frugal to make money. The problem is frugal doesn't go well with healthcare products. These are products humans must consume and must work properly in order to be effective. Standard white poly bubble mailers are the norm for Amazon and discount online retailers. We purchased items from Amazon marketplace in early August that were left at our door in Las Vegas, where the temperature was easily pushing 110 degrees. Even if there was no damage to the actual product, at a minimum it shows how little thought is put into products purchased in marketplaces. Test strips must be stored at room temperature and at low humidity to ensure they function properly. Considering that many test strips are approaching $100 in price, it's amazing more care isn't taken when shipping such expensive items that are critical to the health of the recipient. We discuss this in our blog. CoolPAC is FDA approved for food contact. In a 36 hour thermal test administered by a third party A2LA Accredited Environmental Test Lab, the CoolPAC tested outperformed the competition. After 24 hours, the contents inside the CoolPAC were 10° colder than EPS and 15° colder than other reflective/bubble liners. In a ISTA 7E 24-Hour Summer Heat test, CoolPAC box liners maintained product freshness by keeping the contents under 60° F.
While they cost nearly 14 times more than normal mailers, ensuring your products arrive at your door in usable condition and are accurate is priceless. We use mailers instead of boxes so we can offer free shipping on all orders, passing the savings in postage on to you in the form of lower prices. While it may look like overkill, your items should arrive in working condition. We initially started by wrapping our test strips in corrugated cardboard. While it did the job protecting our boxes during transit, it was not pleasing to the eye. We recently began to package in highly protective bubble wrap that not only protects against damage during shipment, but is also nice visually and to the touch. You can expect to start seeing this packaging in late January 2018. We still use coffee sleeves and if you happen to get one in your package, remember to get your surprise. How about a smile for the camera? He's happy in there, we promise. When you receive your order, if you find your test strips surrounded by a coffee sleeve, don't be surprised. Not only do they protect us against hot beverages, they also work as great protection for our test strips. In addition, you are eligible for a surprise! Test strips are expensive, so extra care should be taken to ensure they arrive undamaged to your doorstep. Remember if you are not completely satisfied, we offer a 100-day return policy.